JQ as he is known, is a Founding member and Vice President of NMDE, and has been diving since 1986 where he invaded the warm waters of Maui. Jimi, an Assistant SCUBA Instructor, has shown an incredible dedication toward instilling safety in the divers within his circle of influence. His enthusiasm toward this sport is exceeded only by his attention to detail in all aspects of diving. Jimi has trained in and is certified in mixed gas diving. 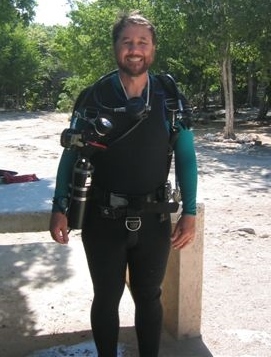 With this experience and training he has developed a complete knowledge of all mission aspects for New Millennium and has become a mission specific critical analyst for all team diving operations. JQ employs a “what if” method of mission analysis in order to make all expedition dives safe and successful. Jimi is also quite knowledgeable in diving with Diabetes and has the resources and experience to council divers with this condition on the aspects of a safe involvement in diving.